Info about regularly-scheduled Storytelling activities by various individuals and organisations in Chennai is here. One section for Teenagers, one section for Adults. The weekly sessions (occurring on Sundays) could be attended in-person in Alwapet, Chennai -- or via Zoom videoconference. One could join anytime. 16 June to 4 August 2019. 19 June to 7 August 2019. Graduates of this Workshop could continue for Certification as a Professional Storyteller. This edition of the Course would occur on Sundays, 2:30pm-4pm. 11 weekly sessions: 16 June to 25 August. * Training in Life Skills, Soft Skills, and Communication Skills. Training / Rehearsals / Performance. Writing, and Telling; and Theatre". Location: Harrington Road, Chetpet, Chennai. 1) Sat 22 June 2019. Storytelling by and for Adults -- Open-mic. Monday, 6th May 2019, 6pm. Cafe Coffee Day Square, on Khader Nawaz Khan Road, Nungambakkam, Chennai. Format: The Storytelling Host would tell a story, and then there would be an open mic (10-minute time-limit per Storyteller). One could tell, or just listen. No need to reserve seats -- please just come by. 2-day or 3-day Storytelling Workshop for Adults. * Storytelling for Teaching and Learning Languages, and any other academic subject. Date and Location by request. This is our flagship Workshop. This Workshop typically occurs as 8 consecutive weekly 2-hour sessions. The Workshop is designed especially for Parents, Teachers, Coaches, Trainers, Therapists, Performers, Creative Writers, Tour Guides, Professional Storytellers, and People interested in becoming any of the above. Two recent articles about the Workshop are here and here . Info about the upcoming edition of this Workshop is here. "Storytelling Workshop for People in the Business World"
"Storytelling for Parents and Children Together"
"Introduction to Storytelling, and Coaching Your Storytelling"
"Story Workshop for Screenplay Writers" (and Others in the Fields of Stage and Screen). 6) Soft / Life / Communication Skills Trainers. 7) Members of Communities or Organisations. These Workshops could include video recording and playback for study purposes. Types of Stories. Finding and Creating Stories. Story and Place. Story and Community. Story and the Past. Story and the Future. Styles of Speaking in Storytelling. Storytelling accompanied by Illustrations, Puppets, and Props. Documentation of CSF 2019 (1-10 Feb 2019) -- and a preview of CSF 2020 (7-16 Feb 2020) -- are here. 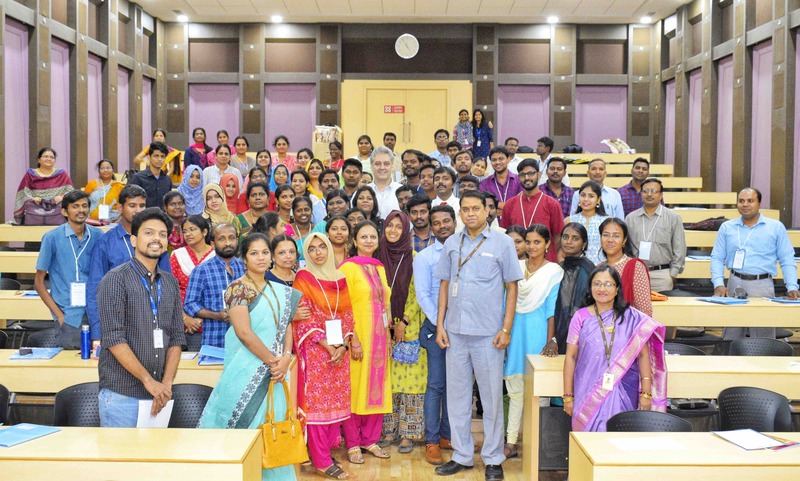 A photo taken after a recent day-long workshop on "Using Storytelling and other Verbal Arts -- including Rhymes, Puns, and Melodic and Rhythmic Speech -- to Teach English Language" conducted by WSI director Dr Eric at the English Dept of the Vellore Institute of Technology (VIT) is here. "Storytelling Workshop on Rhythm, Melody, and Rhyme in Speech; and on Rhythm in Movement", conducted by Dr Eric, WSI Director. Workshop details are here. Chennai Storytelling Festival 2018. This was the 6th annual edition of CSF. Info about all 6 editions of the CSF is here. A Case Study of a client of a participant in Dr Eric's Storytelling Therapy videoconference course (Fall 2017 edition), including the Healing Story: "Budur and the Moon Rabbit." All written primarily by the participant and her client. 1) Notes on Creative Writing and Storytelling. 2) Reasons to Engage in Creative Writing. 3) Study Skills: Writing Notes and Preparing for Exams. All four of the above links are here. Incidentally, links to essays relating to Storytelling for Teaching-and-learning are here. Dr Eric began teaching a 13-session Course on Storytelling Therapy via videoconference. This Course is occurring during the Fall 2017 semester (Sept-Dec). It would also be offered during the Spring 2018 semester (Jan-April). The Course is described here. Course readings are here. 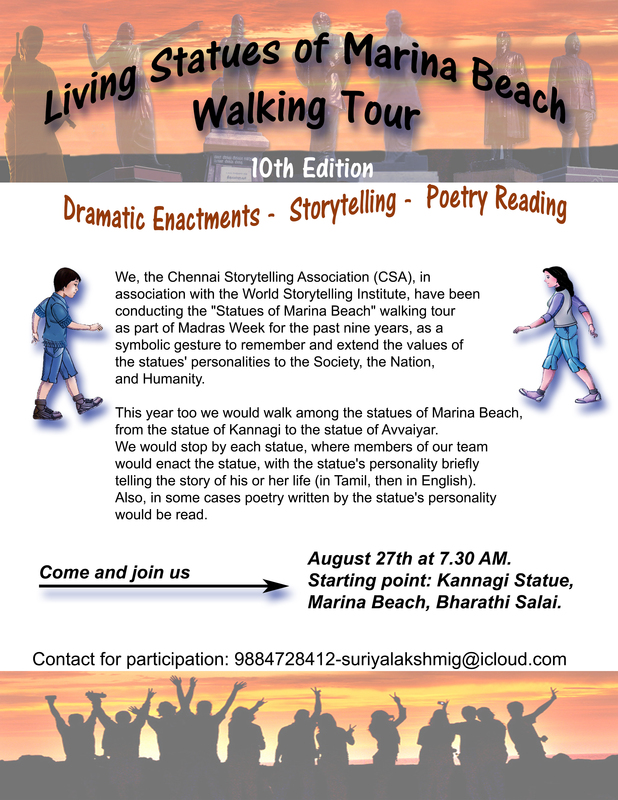 The 10th Annual "Living Statues of Marina Beach" Walking Tour. Photos are here and here. Additional info about the event, including the suggested scripts (in English), is here. The Poster is here. 1) Handout for the full-day Pre-conference Workshop on "Storytelling for Self-Development". 3) Notes for a presentation on storytelling in the Panel on Self Discovery through Expressive Arts for Human Resource Development. 4) Notes for a presentation of his paper, "Story and Storytelling in Storytelling Therapy and Expressive Arts Therapy". 5) "Story and Storytelling in Storytelling Therapy and Expressive Arts Therapy", paper published in the Conference proceedings. Chennai Storytelling Festival 2017. Festival info -- including the Festival schedule, and links to photos of performances -- is here. The WSI hosted a Workshop on "Using Fairytale and Myth in Drama-and-Movement Therapy". The Workshop is described here. A review of the Workshop is here. Some photos of the 9th Annual "Living Statues of Marina Beach" Walking Tour are here. The Walk features brief dramatic enactments -- in Tamil and English -- of 6 statues. The suggested scripts (in English) are here. The Walk is facilitated by the WSI, and this year's edition was an event in Madras Week 2016. 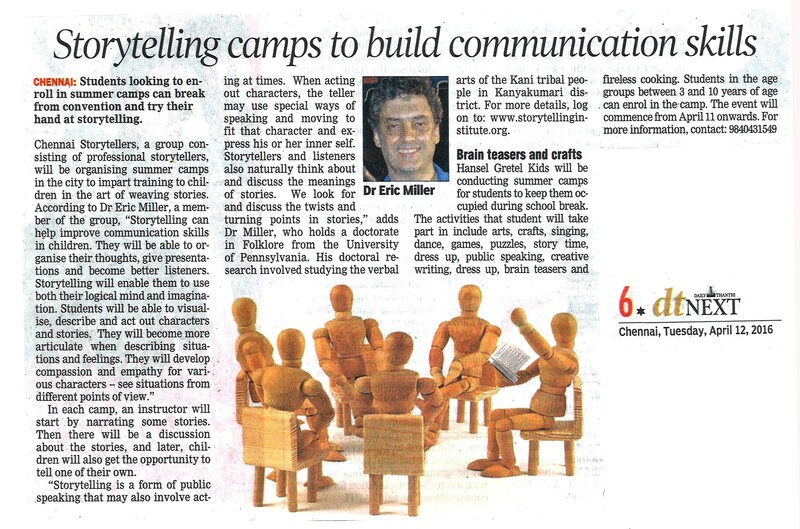 A list of Storytelling Instructors in Summer Camps in Chennai is here. An article about this is here. Storytelling by and for Adults. At Café Coffee Day Square, Chennai. A description of the series is here. Links to 5 articles about these events are here. * August 2016, "It happened in Chennai". * July 2016, "Things one loves to do". * June 2016, "Patience is a virtue ... sometimes". * May 2016, "The importance of gentleness". * April 2016, "The straw that broke the camel's back". 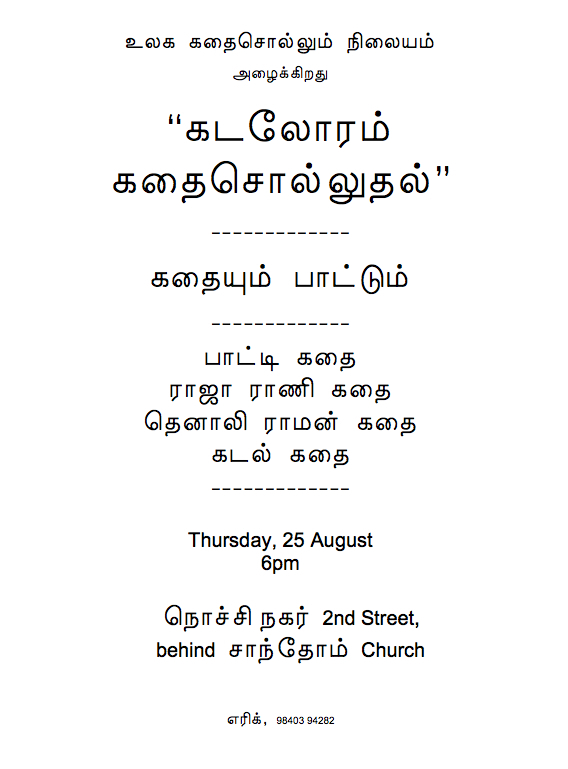 * Aug 2014, "The moment I decided to live in Chennai" (an event in Madras Week 2014). * July 2014,"A dream come true". * June 2014, "An eye-opening experience". * March 2014, "Real-life adventure stories". * Feb 2014, "I made it look easy". * Jan 2014, "If at first you don't succeed, try, try again". * Dec 2013, "The best gift I ever gave or received". * Nov 2013, "The day I became human". Photos are here. The WSI collaborated with The Paintbox (a team of painters) and local people, to paint a mural on a wall near WSI headquarters. The title of the mural is "Art Gallery in a Jungle". Images of the mural are here. Online recordings of videoconferences co-facilitated by WSI director Dr Eric. Approximately 35 people led Storytelling Workshops in CSF 2016. Guidelines for leading a basic "Storytelling Workshop" are here. A list of 20 "Storytelling Workshop Activities" is here. "Storytelling Therapy" Workshop in New Delhi, at Children First. For the Flier, please click here. For an essay (4 pages) on the topic, please click here. The WSI's "Storytelling in Schools (and Colleges)" initiative is described here. Links to articles providing evidence that storytelling activities can help students to improve their general academic abilities are here. "Ways Verbal Play such as Storytelling and Word-games Can Be Used for Teaching-and-learning Languages". 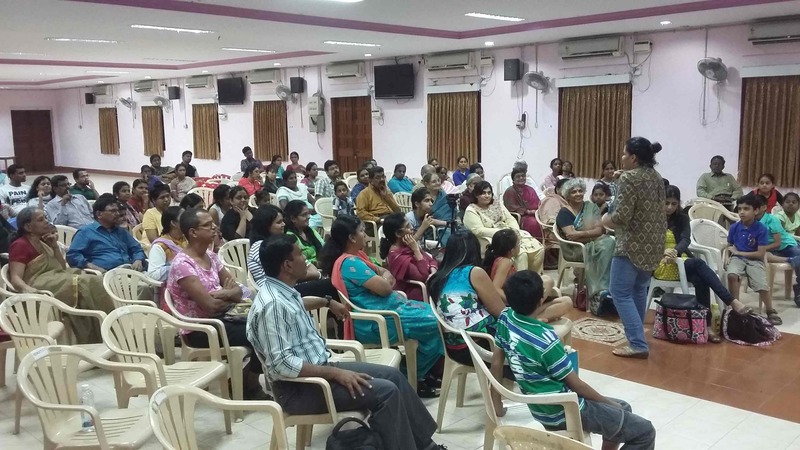 World Storytelling Day 2015 was celebrated in Chennai at the University of Madras. 15 Storytellers (members of the Chennai Storytellers) told on this year's theme, which was "wishes". The event was supported by the WSI, and WSI director Dr Eric also performed. A photo of the event is here (Aparna Ashwin is the teller in this photo). "Storytelling for Teaching and Training"
(4-15 Feb 2015) -- and all three editions of the Chennai Storytelling Festival -- is here. The WSI founded, and has been the leading presenter of, the Chennai Storytelling Festival. Travel. Tourism. Translation. Journey and Path as metaphors. Visiting other lands and worlds. Discovery and Exploration of the other, and of the self. 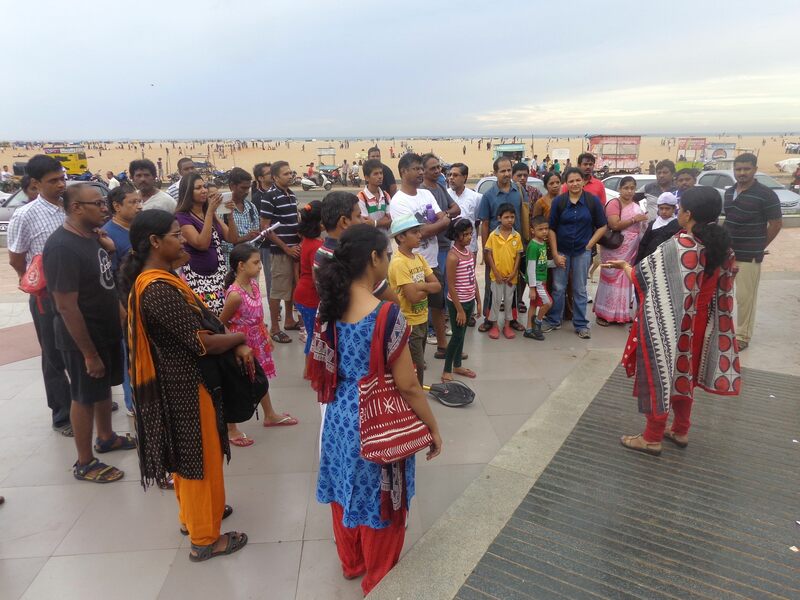 Seventh Annual "Living Statues of Marina Beach" Walking Tour (an event in Madras Week). Brief Dramatic Enactments of 8 Statues (in English and Tamil): Kannagi, NSC Bose, Thiruvalluvar, GU Pope, Bharathidasan, Avvaiyar, Subramania Bharathi, and Mahatma Gandhi. Info (including the scripts in English) is here. Videoconference on Dragons and Monsters. Info about, and a link to a recording of, this videoconference is here. (Storytelling as a Healing Art). Links to recordings of webcasts of Workshops (some featuring videoconferences) are here. An article in The Hindu is here. Videoconference on Storytelling and Healing. Ethnographic Videoconference between 11th Standard students in Chennai, and in Burlington, Wisconsin, USA. The students discussed their identities in terms of their uses of language, etc. A link to a recording of the videoconference, and additional info about the event, are here. Location: Pechiparai, Kanyakumari district, Tamil Nadu. The Poster is here. Additional info is here. A Kaani folk tale is here. Links to photos of Kaani people, etc, are here. Ideas regarding developing tribal cultures are here. An article on the Festival is here. Festival photos coming soon. WSI Director Dr Eric delivered the Inaugural Address at the 3rd International Meeting of the Kanyakumari Academy of Arts and Sciences, in Nagercoil. The text of the Address, titled "The Value of the Multi-Discipline Approach to Research", is here. Storytelling about Beach and Ocean Eco-Systems. At numerous locations in Chennai. The poster is here. Additional info is here. 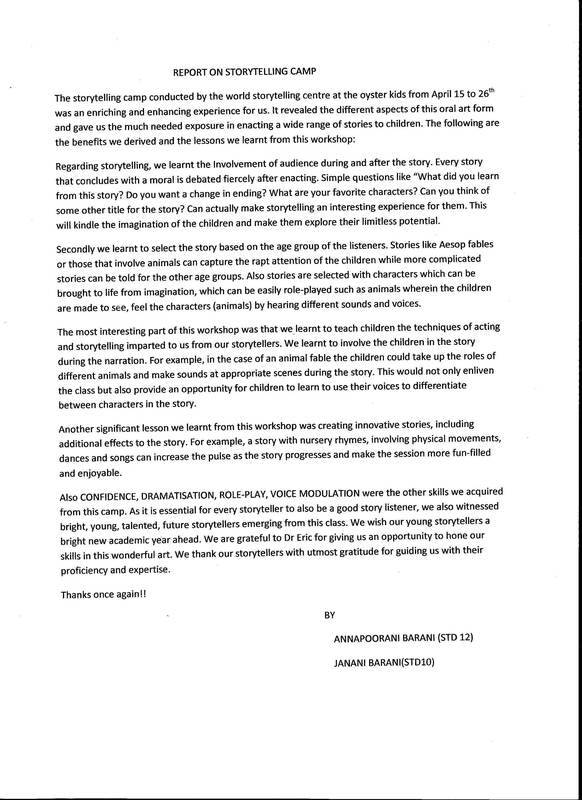 A report written by two teenage Storytelling-Instructor Trainees regarding the April 2013 WSI Storytelling Summer Camp for Children (ages 6-years-and-above) they attended is here. Presented by the WSI and the East-West Center for Counselling. Especially for people who work in NGOs and in fields involving caring for people and helping them to grow and heal. Some introductory words about Storytelling Therapy are here, and additional information about the Workshop is here. WSI Director Dr Eric co-presented a paper entitled, "Tribal Peoples as Leaders of Society in a Future in which Fossil Fuels might be Scarce, with Special Reference to the Kani Tribal People of South India", at the National Conference on "Tribal Literature: Across Continents and Cultures", at V. O. Chidambaram College, in Thoothukudi, Tamil Nadu. The Handout is here. Teaching and Learning about Storytelling. Here is the Poster (with schedule). Here is the Announcement (with photo). Here is info about the Storytelling Performance on Fri 1 Feb, at 5:30pm. Here is info about the Post-Festival Field-trip to Thanjavur. 1) "The Tale Trail", Indian Express. 2) "Nurturing the Art of Spinning a Yarn", The Hindu. 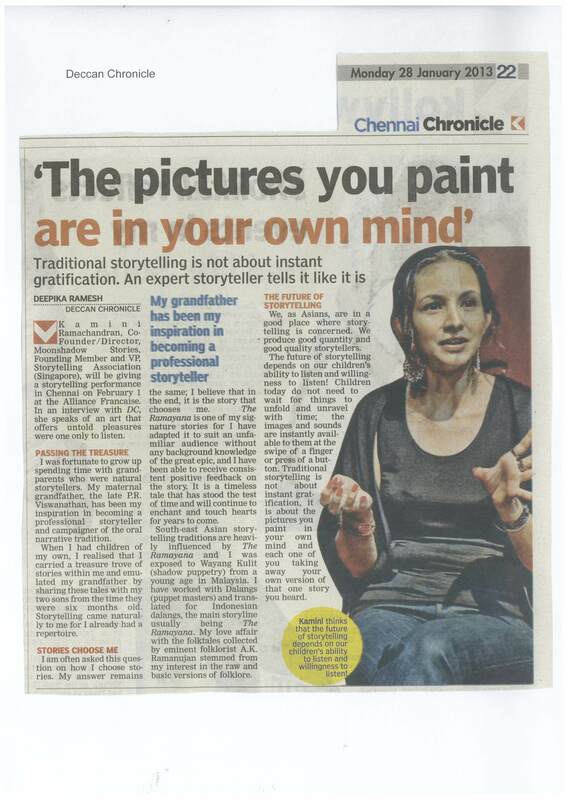 3) "Pictures in Your Mind", Deccan Chronicle. 4) "How to Spin a Yarn", Deccan Chronicle. 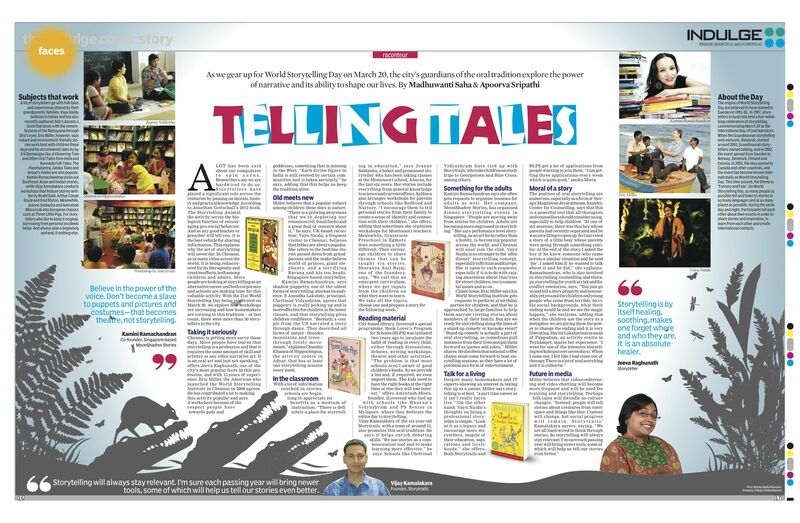 5) "Telling Tales", Indian Express. 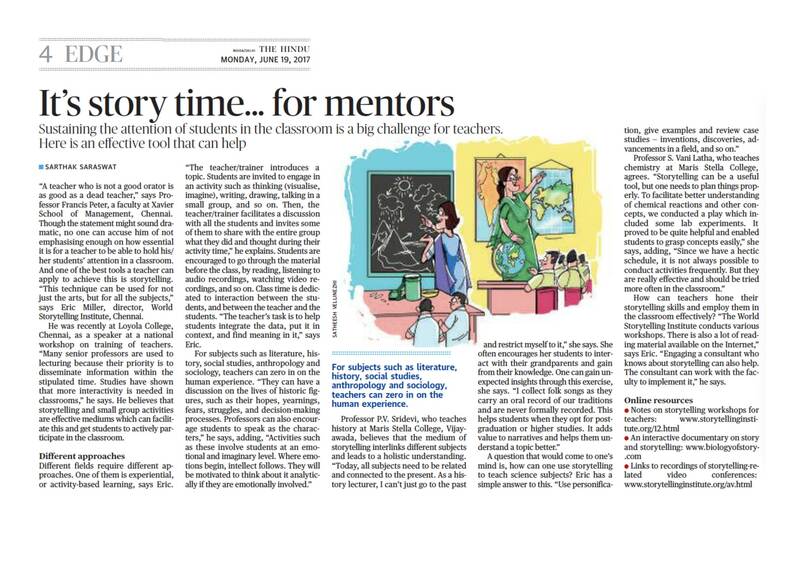 1) "Timeless Tales", The Hindu. 2) "Thanjavur Tales, Made in Chennai", Indian Express. 3) "Is Indian Storytelling a Dying Art? ", BBC Online. 4) "Indian Storytellers Struggle to Keep Traditon Alive", Deutsche Welle (an international news service based in Germany). 1) Videoconference between students at IIT-Madras, and American University in Cairo (AUC). In AUC' s Global South Dialogue Course. Session topic: "Everyday Creativity: 'Indian' and 'Egyptian' Ways of Doing Things". Wed 24 Oct. The handout is here. A recording of the videoconference (which was also webcast) is here . 2) Talk on "Story Composing, Writing, and Telling; and Creativity in General". At the English Dept, Annamalai University, Chidambaram, Tamil Nadu, Tues 18 Sept. Links to Speaking notes and related files are here. 3) Talk on "The Story-making Process of the Human Mind". At the Conference on Enriching the Connection between Literature and Life, Periyar University, Salem, Tamil Nadu, Tues 4 Sept. Speaking notes are here. 4) Talk on "Applying Principles of 'Conversation Analysis' to the Facilitation of Student-Participation in Classroom Discussions". At the Teaching-and-Learning Center, IIT-Madras, Thurs 23 Aug. The Handout is here. Speaking notes are here. Links to writings on Conversation Analysis, and Collaborative Teaching-and-Learning, are here. 5) Workshop in "Science Fiction Story Writing and Telling". At the 13th National Science Fiction Conference, at Bharathiyar University, in Coimbatore, Tamil Nadu, Fri 20 Jan. An article on the session is here. Storytelling Performances by Members of the Chennai Storytelling Association at Oxford Bookstore (Haddows Road, Nungambakkam): "Storytelling about Families", with Special Guest Storyteller from Belfast, Northern Ireland, Steafan Hannigan. "Stories about Language, Words, and Stories" (Sept 2012). "Living Beside the Sea" (August 2012). "Heroic Animals in Folk Legends" (June 2012). "Strong and Active Heroines in Fairy Tales" (April 2012). "Honesty and other Civic Virtues" (Feb 2012). "Recycling and Eco-systems" (Jan 2012). The WSI co-leads the Storytelling Therapy component in the year-long (Nov to Dec) Diploma Course in Expressive Arts Therapy. Customised training sessions in Storytelling Therapy -- especially for people in the Care-Giving and Mental Health Professions -- are also available. Storytelling Performance in Dharamsala, Himachal Pradesh -- Tibetan folk tales about Aku Tompa (Uncle Emptiness) were told by WSI Director Dr Eric Miller and others in Dharamsala (a home of Tibetan people in India), at the Volunteer Tibet Centre. For links to the texts of two of the stories, and some commentary about the stories and the event (with photos), please click here. To celebrate World Biodiversity Day, the Centre for Environment Education, and the National Biodiversity Authority, organised a function on Marina Beach to mobilize public support for Coastal and Marine Biodiversity Conservation. As part of this event, the World Storytelling Institute (especially Mr Devarajan) helped to arrange for members of Chennai's sea-fishing communities (led by Mr Neelamegam) to sing rowing songs and tell sea-related stories. Photos are here. This event is related to the ongoing project of developing a Living Museum on the Heritage of Traditional Sea-Fishing and Sea-Travel in the Marina Beach area. 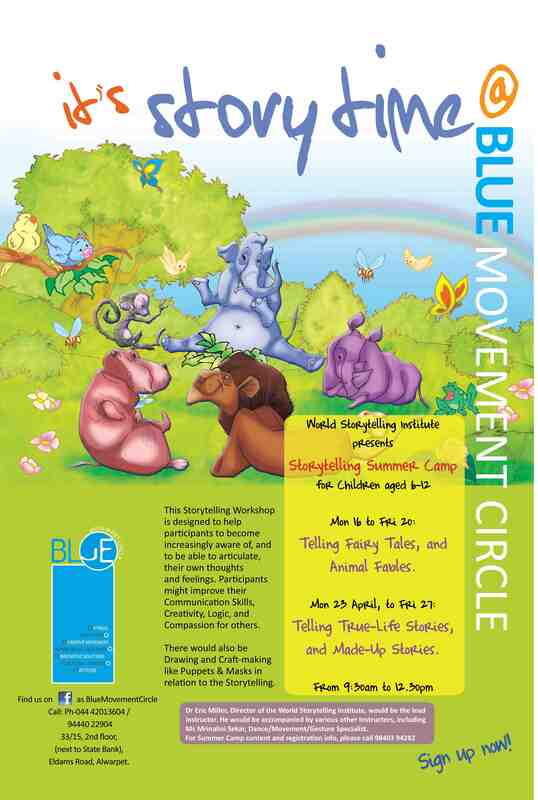 Storytelling Summer Camp for Children. The Poster is here. Photos are here. by WSI Storytellers Asha, Sandhya, Sudha, and Karpagam. WSI Storytellers told stories on this theme at schools throughout Chennai (in English and Tamil) in January, as part of the Prakriti Foundation's Tree of Life Festival. If interested in having these stories told at a school, please contact the WSI. The WSI (Chennai) and Kathalaya (Bangalore) founded the Indian Storytelling Network . The WSI presented Christmas Storytelling at Oxford Bookstore Chennai. The storytellers were Asha, Trupti, Sandhya, and Eric. The stories included, "A Christmas Carol," "The Gift of the Magi," "Rudolf the Red-Nosed Reindeer," and "The Nutcracker" (the story upon which a very popular western ballet is based). Storyteller Helmut Wittman of Austria conducted a two-session Storytelling Workshop, and gave a Performance. Details are here. The WSI e-newsletter (Nov 2011) is here. On Fairy Tales, and Child Development. 1) India's National Folklore Support Centre Director Dr Muthukumaraswamy presented a paper about the Patukalam (final battle) episode of the Mahabharata. 2) WSI Director Dr Eric introduced the concept of "Ethnographic Videoconferencing" -- the paper is here. A recording of the videoconference is here . Additional info about the event is here. 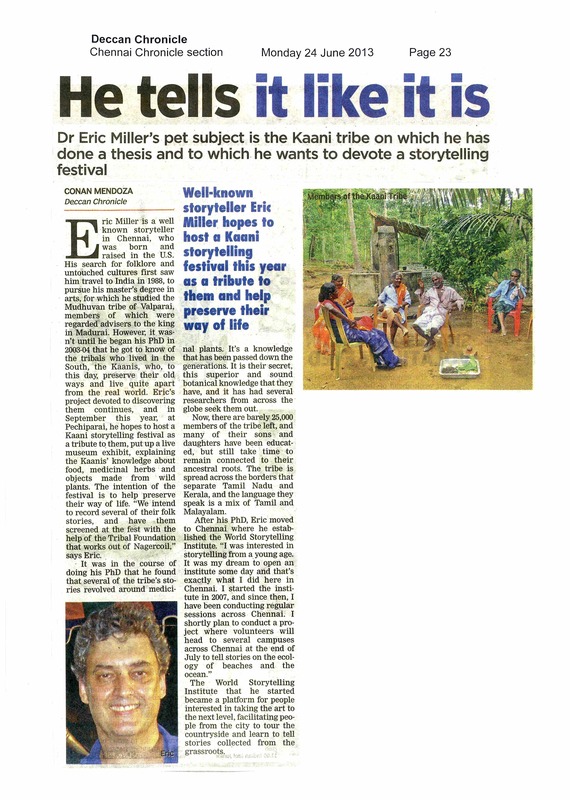 WSI Director Eric led a "Storytelling Workshop inspired by Tribal Storytelling", at the Festival of Indigenous Storytellers, Fireflies Ashram, Bangalore. Information about the Workshop is here. The Festival (and Workshop) is being planned to occur in various locations in India. If interested, please let us know. Dr Anita Ratnam led a Storytelling session at Oxford Bookstore Chennai. She brilliantly activated the children to physically act-out the characters. A number of times, she even led the children in "story parades" around the space. A newspaper review is here. The WSI e-newsletter (Sept-Oct 2011) is here. "Storytelling by the Sea / Kadalooram Kathaisolluthal". Community members told Folktales about the Sea (in Tamil). Location: Nocchi Nagar 2nd Street (behind Santhome Church). Invitation as pdf file, and as jpg file. Photos are here. This event supported the effort to establish a Living Museum about the Heritage of Sea-Fishing in the neighborhood; additional info about this is here. "4th Annual Living Statues of Marina Beach Walking Tour". Brief Dramatic Enactments of each Statue (in English and Tamil): Kannagi, NSC Bose, Thiruvalluvar, George Pope, Bharathidasan, and Auvaiyar. WSI Director Dr Eric has written a paper entitled, "Aspects of the Storytelling Revival in India". Feedback would be most appreciated. Chennai Coastal Carnival for Children! A Festival to Promote Coastal Conservation. At Marina Beach (near the NSC Bose Statue). Organised by the Center for Environmental Education, with Cultural Events facilitated by the WSI: Performances and Exhibitions by Men, Women, and Children of Chennai's Sea-fishing Communities (in Tamil language). The Children performed a skit on "A Day in the Life of a Fishing Village", featuring their own stories, songs, poetry, and essays. Photos are here. 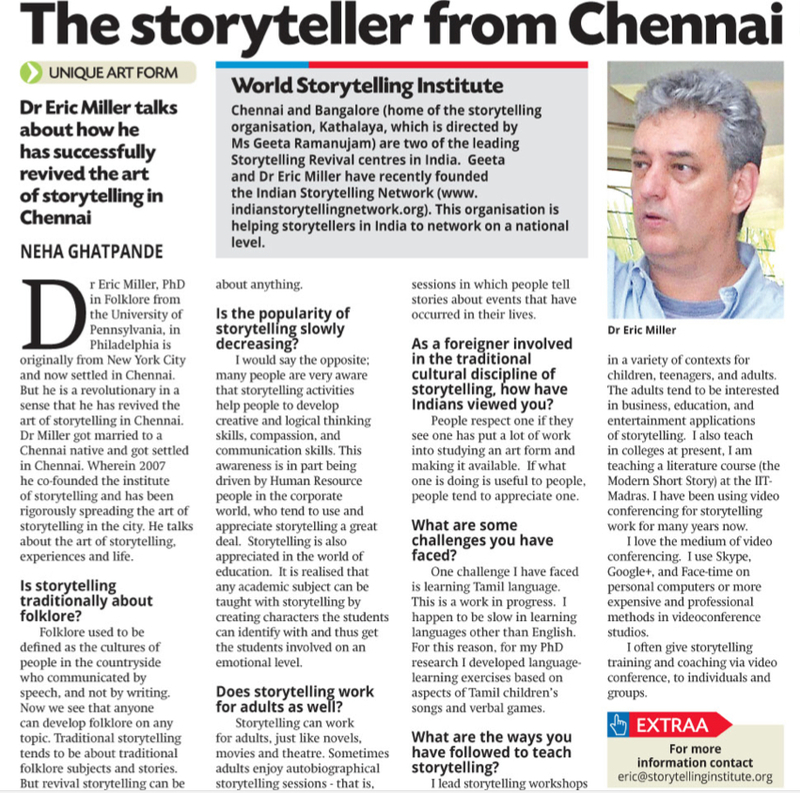 Dr Eric, Director of the WSI, was the Oxford Bookstore Chennai storyteller this month. A review is here. Launching its YEAR OF STORYTELLING, World Storytelling Institute and Oxford Bookstore Chennai presented a Storytelling (with Arts and Crafts Activities) Event for Children. Ms Trupti Sayani was the Storyteller. Photos are here. 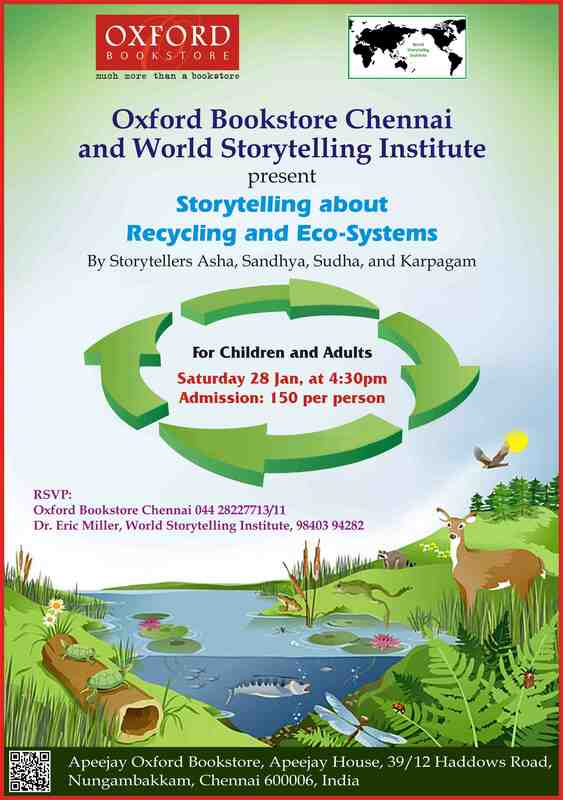 World Storytelling Institute and Oxford Bookstore, Chennai, presented a free Storytelling Session. This was the end-of-Workshop performance, by participants in the current Storytelling Workshop for Adults. Approximately 18 Adults and 3 children attended. Photos are here. World Storytelling Institute and Oxford Bookstore, Chennai, presented a Summer Storytelling Festival for Childen. 6 Storytellers in 6 days, 5-6:30pm daily. Adults told stories, and the children did artwork to express their visions of the stories. Three articles relating to the Festival are here. 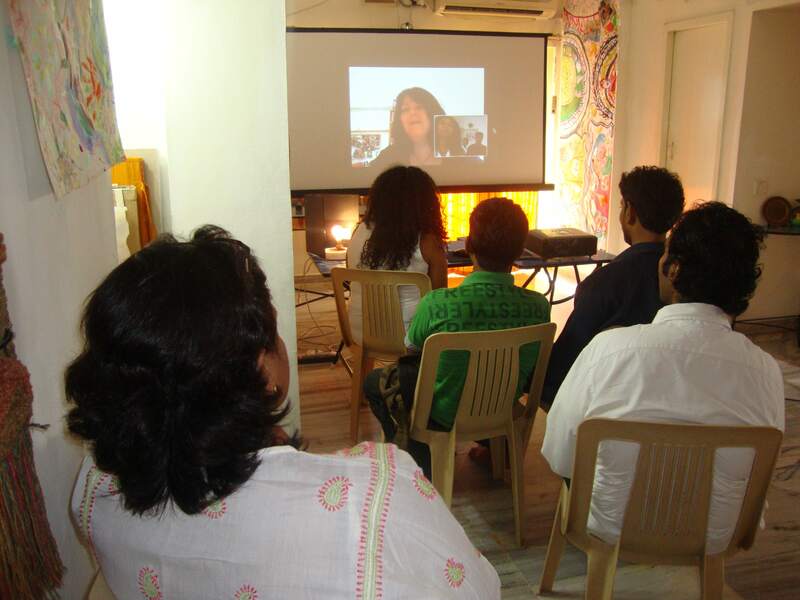 Before the CSA monthly meeting, Storyteller Sally Pomme Clayton in London spoke with us in Chennai via Skype videoconference. A photo of the videoconference -- from the Chennai side -- is here. California-based Storyteller Cathryn Fairlee's performance of "Folktales about Strong and Clever Women" at the Savera Hotel here in Chennai was very well-received! Cathryn's website is here, and an article about her visit to Tamil Nadu is here. CSA monthly session of Storytelling for Adults (first Tuesday). Today's topic was, "The odds were a million-to-one against me, but I did it anyway." Photos are here. Before the CSA monthly meeting, Storytellers Johanna and Scott Hongell-Darsee in Albuquerque (New Mexico, USA) performed for us, and spoke with us, in Chennai via Skype videoconference. Photos of the videoconference are here. Presentation for Chennai School Librarians on "Using Storytelling to Facilitate Reading and Writing" -- the notes are here. This Workshop was organised by the Madras Library Association, at Anna Library in Kotturppuram. A two-page essay based on these notes, "Storytelling and Story-listening, and Children's Intellectual, Emotional, and Social Development," is here. 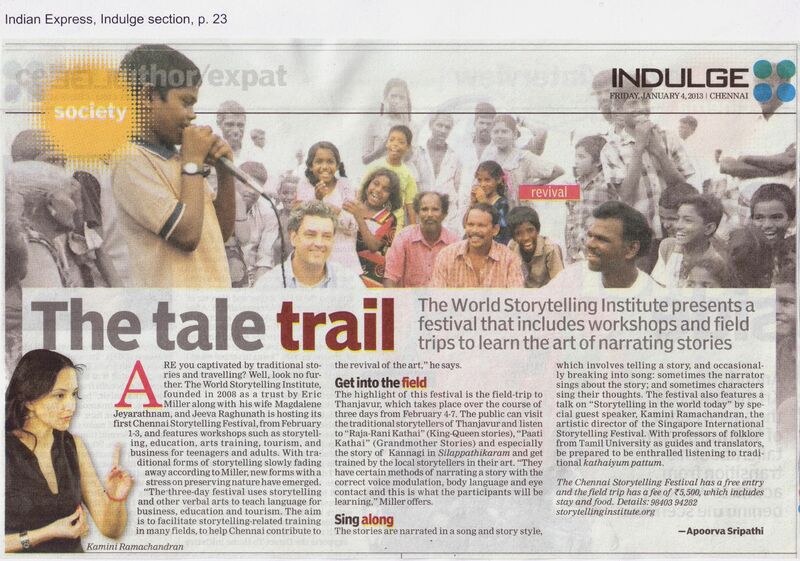 The WSI/CSA provided four storytelling sessions in the Chennai Sangamam 2011 folk performing arts festival. Links to photos and video of these storytelling sessions -- along with essays about Chennai Sangamam over the past three years -- are here. The Chennai Storytelling Association began in Nov 2010. There are now approx 200 members. Many have attended multi-session WSI Storytelling Workshops. 1) The development of lesson plans for training adults and children in the art of storytelling (in English and Tamil). 2) Storytelling Workshops for adults and children. 3) Storytelling Performances for children (in English and Tamil). 4) Monthly sessions of personal-experience storytelling (for and by adults), open to the general public. Presently, these sessions are occurring at a Cafe Coffee Day. Info about these events is here. 5) Visits to the Tamil countryside, to meet with storytellers there, to hear and collect their stories, and to receive training in storytelling from them. The CSA is also developing methods of (audio and visual) translation that could be used during storytelling events. 1) Vasugi Ram Manohar directs Madras Story Works in Egmore (98401 18590). Storytelling for children each Saturday at 11am. Info is here. 2) Asha Sampath directs Tale Spin in Anna Nagar (98408 33953). Storytelling on one Saturday afternoon each month. Info is here. 3) Kavitha Thyagarajan and Debjani Bhaduri direct Once Upon a Time in RA Puram (99400 36390 and 98402 76914). Info is here. 4) Sheetal Rayathatha directs Square Heads (Phonics and Storytelling) in Kilpauk (98400 91290). Info is here. 5) Sandhya Rubens directs Eloquens (Soft-skills training, Storytelling, etc) in Ayanavaram (98401 77215). Info is here. 7) Magdalene Jeyarathnam directs the East-West Center for Counselling and Training in Nungambakkam and Kilpauk (98841 00135). The EWCFCT provides Expressive Arts Therapy (including Therapeutic Uses of Storytelling) for children and adults, and also provides training in Expressive Arts Therapy. Info is here. 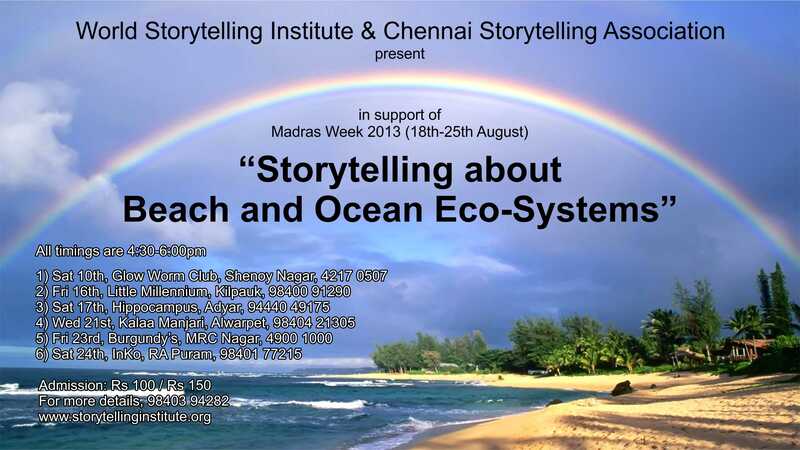 For additional info about the Chennai Storytelling Association, please call 98403 94282. "Narrating Tales for Gender Inclusion at the Workplace", DT Next (Chennai), 31 Oct 2018. "Conversations with God, Cinderella, and Fear", The Hindu (Chennai edition), MetroPlus section, page 4, 31 August 2018. Dr Eric Miller is the Assistant Director of the Indian Institute of Psychodrama, as well as being the Director of the World Storytelling Institute. "Healing Touch: When Art Forms Become Therapy", DT Next, page 2, 23 August 2018. "Down Dravidian Lane, by the Beach", Times of India (Chennai edition), page 2, 23 August 2018. "The Dravidian Movement and the Art of Storytelling", The Hindu (Chennai edition), page 2, 23 August 2018. "An Ode to the Late Dr Karunanidhi by Dr Eric Miller of the World Storytelling Institute in Chennai", Merinews, 9 August 2018. "Tattle Like a Grown-up", The Hindu, Metroplus section, page 6, 9 Feb 2018. Relating to Chennai Storytelling Festival 2018. "Stories Can Connect with Everyone", The Hindu, page 2, 7 Feb 2018. "Over 34 Storytellers to Attend Chennai Storytelling Festival", Indian Express, Indulge section, 2 Feb 2018. "Feminist Tales of Yore", The Hindu, Metroplus section, page 4, 1 Feb 2018. Chennai Storytelling Festival is Here", The News Minute, 29 Jan 2018. "Sailors of Stories", Indian Express, Sunday Magazine cover story, 29 July 2017.
in India. Dr Eric, WSI Director, is mentioned on page 11. "How Art Alters Life", Deccan Chronicle, Chennai Chronicle section, 29 July 2017. Mental Health", First Post (Mumbai), 23 July 2017. 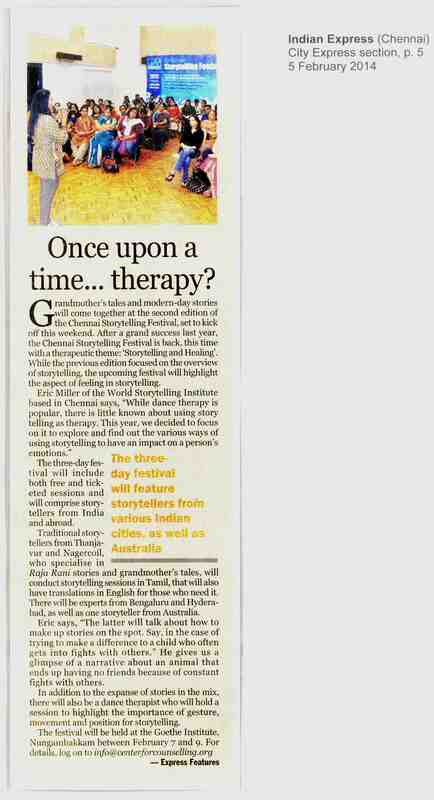 "Workshop on Storytelling Therapy to be Conducted in Chennai", Times of India, City section, 7 July 2017.
page 4, 19 June 2017. "Storytelling can Effectively Train Employees", The Hindu (Visakhapatnam edition), 7 March 2017. "A Magnet Called Kannagi", The Week, pages 82-3, 25 Dec 2016. "Tale and Hearty", Bangalore Mirror, page 7, 27 Nov 2016. Mentions Dr Eric’s work with Storytelling Therapy. "A Story is Always More Important than the Teller", Indian Express, Chennai Express section, page 3, 19 Oct 2016. "Storytelling via Interactive Video? ", Indian Express, City section, page 3, 19 May 2016. "Spin Me a Tale", The Hindu, Metroplus section, 10 Feb 2016. About storytelling for business training, and Chennai Storytelling Festival 2016. "Right Things to Say and The Way You Say It Makes a Good Story", Indian Express, Expresso section, 10 Feb 2016. About Chennai Storytelling Festival 2016. 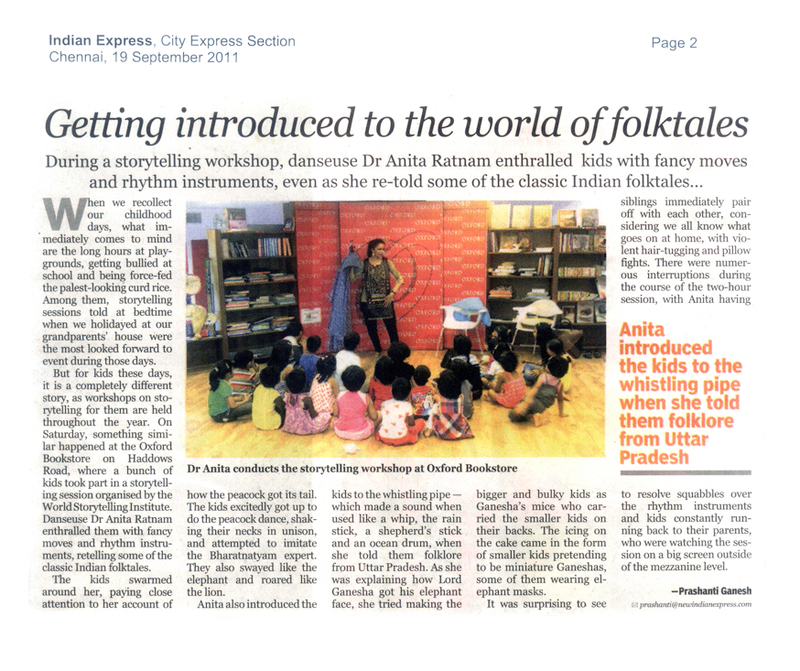 "Storytelling Fest Celebrates Art of Spinning Tales", Indian Express, 4 Feb 2016. About Chennai Storytelling Festival 2016. "Telling Effect", The Hindu (Madurai edition), Metroplus section, 3 Feb 2016. About a Storytelling Workshop at American University in Madurai. 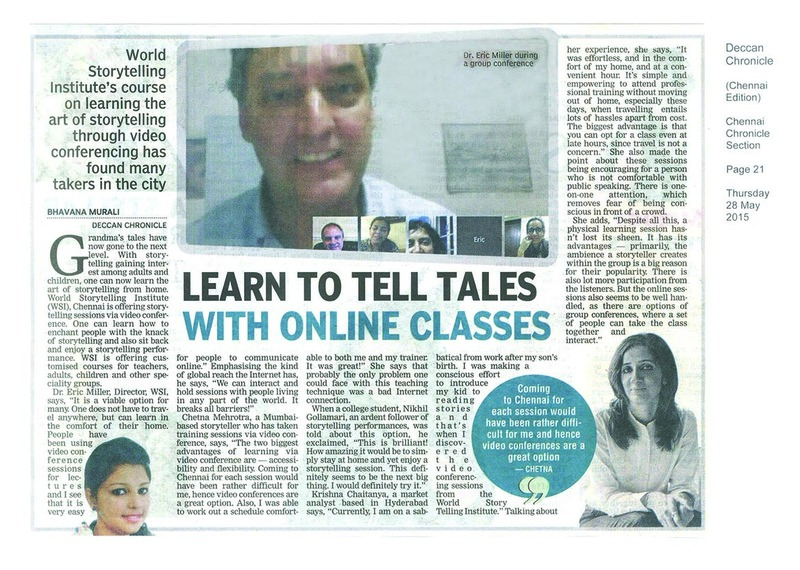 "Learn to Tell Tales with Online Classes", Deccan Chronicle, Chennai Chronicle section, 28 May 2015. About storytelling training for adults via videoconference. "Stories that Changed Lives", Indian Express, City Express section, 12 Nov 2014. About storytelling by and for adults at a CCD. "A Storyteller's Tale", India Currents Magazine, Oct 2014. "The Many Ways of Telling Tales", The Hindu, 23 June 2014. About the Storytelling Workshop for Adults. "And They Lived Happily Ever After", The Hindu, 14 Feb 2014. About Chennai Storytelling Festival 2014. 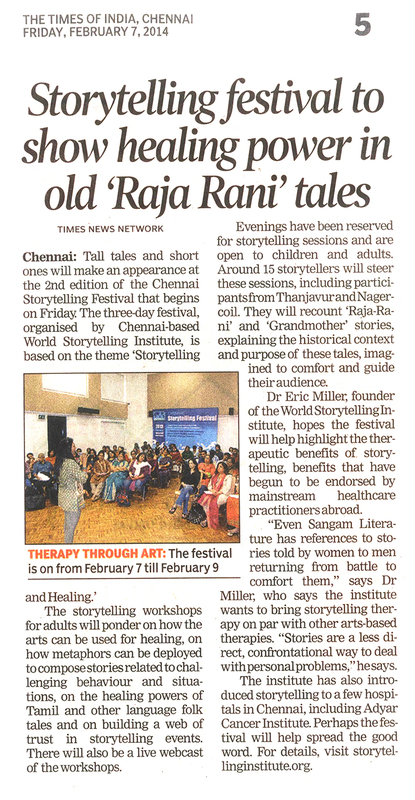 "Storytelling Festival to Show Healing Power in Old Raja-Rani Tales", Times of India, 7 Feb 2014. About Chennai Storytelling Festival 2014. "Once Upon a Time...Therapy? ", Indian Express, City Express section, 5 Feb 2014. 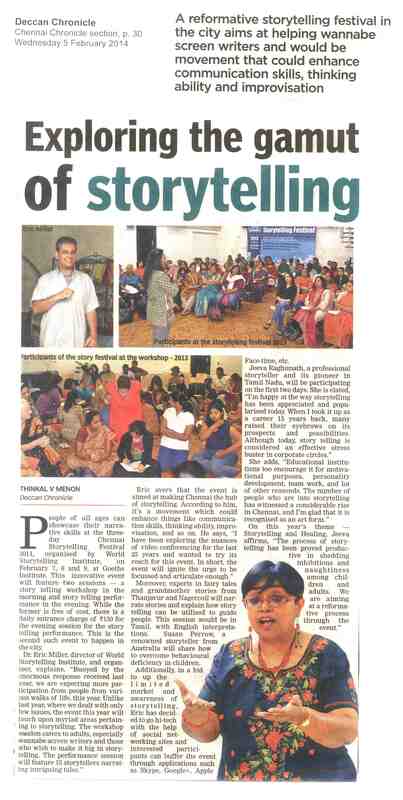 "Exploring the Gamut of Storytelling", Deccan Chronicle, Chennai Chronicle section, 5 Feb 2014. About Chennai Storytelling Festival 2014. "The Chennai Storytelling Festival", Le Petit Chennai (online newsletter in French), Jan 2014. An English translation of the article is here. 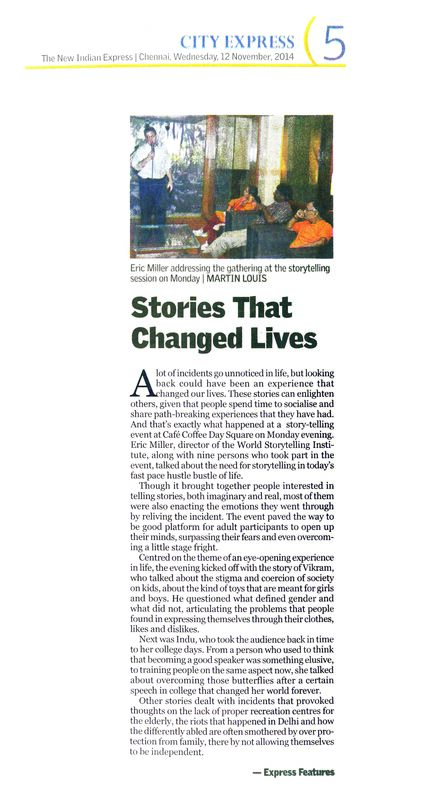 "A Lot More than Just Storytelling", New Indian Express, 19 Nov 2013. About personal-experience storytelling by and for adults, in a cafe. 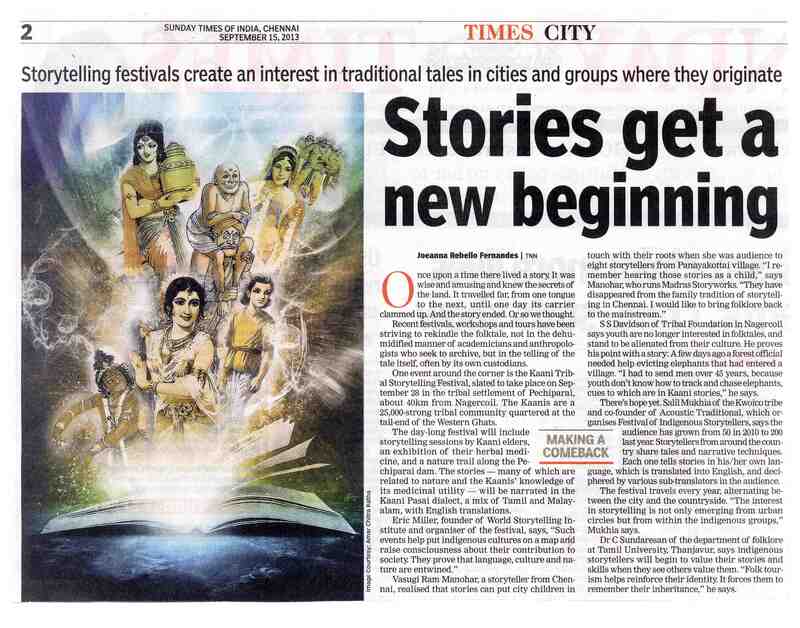 "Stories Get a New Beginning", Times of India, 15 Sept 2013. 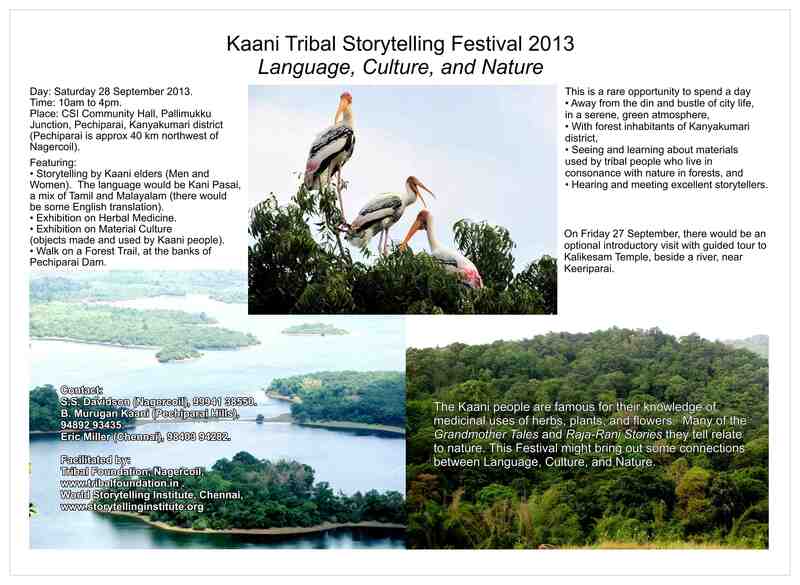 About the Kaani Tribal Storytelling Festival. "A Twist in the Tale", The Hindu, Sunday Magazine section, 7 July 2013. "He Tells It Like It Is", Deccan Chronicle, 24 June 2013. "Indian Storytellers Struggle to Keep Tradition Alive", www.dw.de (German news website), 2 May 2013. "To Learn, To Speak, To Grow", Indian Express, 19 April 2013. "Is Indian Storytelling a Dying Art? ", BBC News Online, 23 March 2013. 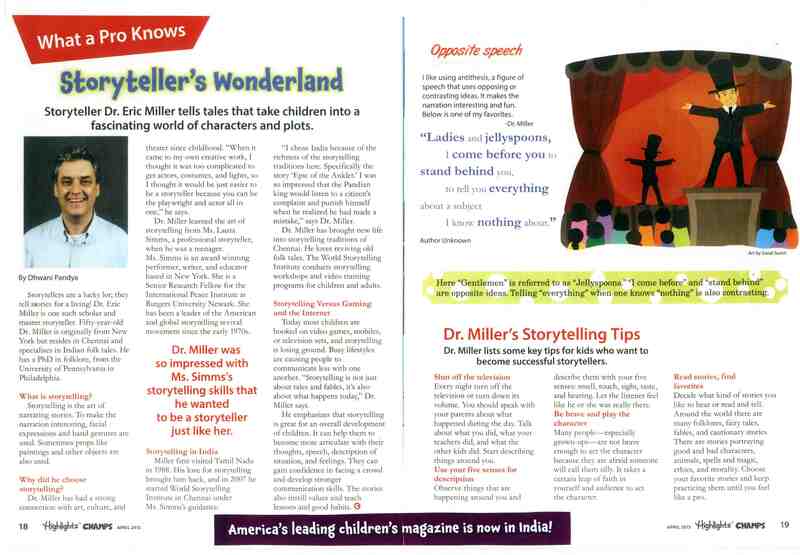 "Storyteller's Wonderland," Highlights Champs, India edition, April 2013. "The Tale End of Tradition", Rail Bandhu, the Railway Dept Magazine, March 2013. "Telling Tales," Indian Express (15 March 2013). "How to Spin a Yarn Your Way", Deccan Chronicle (29 Jan 2013). About the Chennai Storytelling Festival. "Nurturing the Art of Spinning a Yarn", The Hindu (28 Jan 2013). About the Chennai Storytelling Festival. "The Tale Trail", Indian Express, 4 Jan 2013. About the Chennai Storytelling Festival. "What is All the Drama About? ", Deccan Chronicle, 10 Nov 2012. 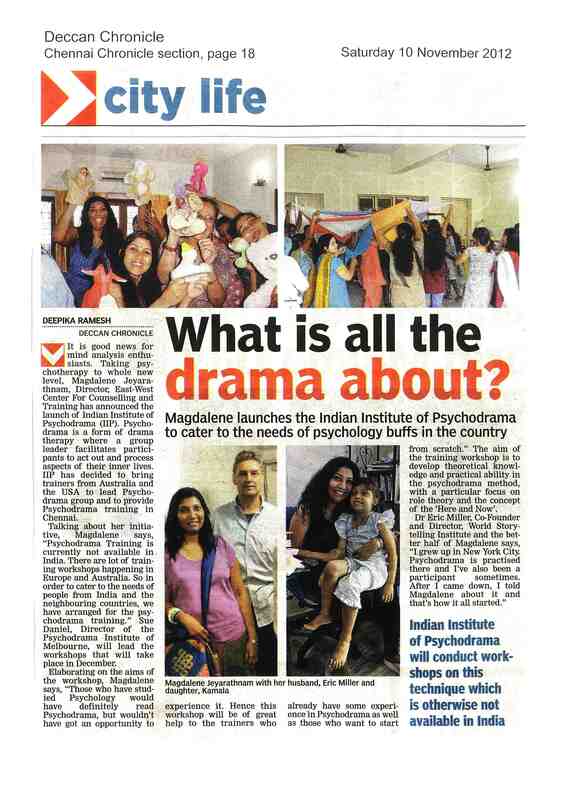 About the Indian Institute of Psychodrama, which is affiliated with the WSI. 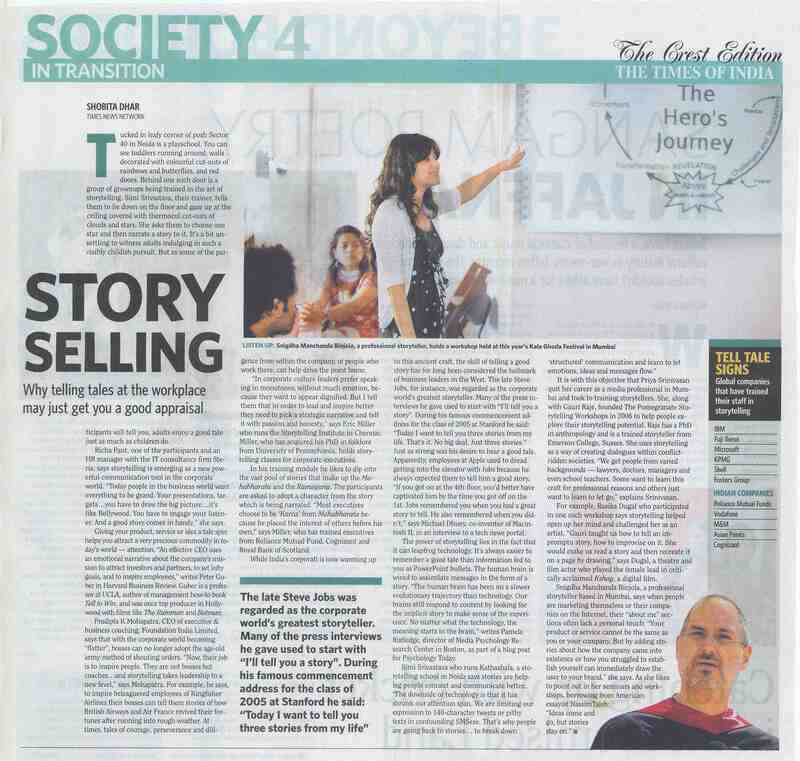 "Story Selling", Times of India, Crest Edition, 2 Sept 2012. "The Primal Art", Mint, 9 Sept 2012. "A Storyteller's Story", Deccan Herald, Bangalore edition (15 April 2012). "Science Fiction Writers Should be Socially Responsible", The Hindu, 21 Jan 2012. "When the Hare Beat the Tortoise: Today's Storytellers Are Not Just Rewriting Old Stories. They Are Using New Means -- 3D, Videoconferencing, and Tour Expeditions -- To Tell Them", Sunday Express, New Delhi, 6 Feb 2011. "Now Here's a Good Story to Tell", Indian Express, 27 Nov 2010. 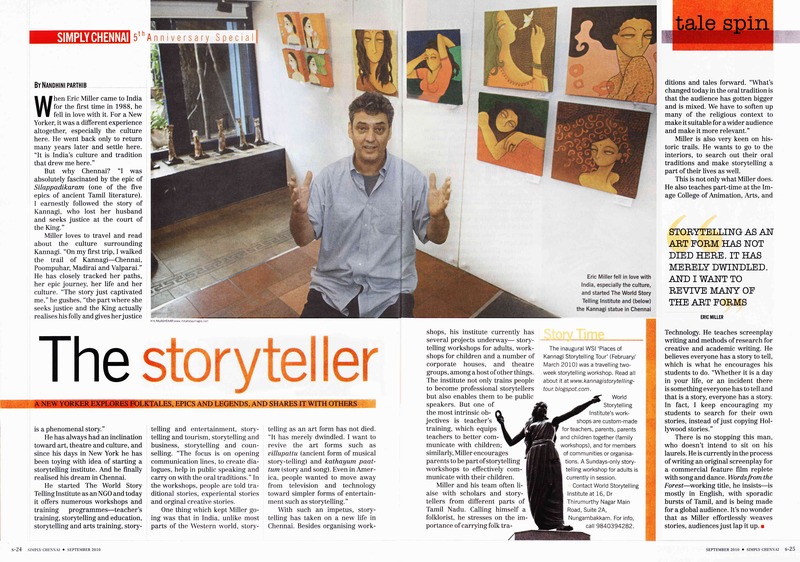 "A Storyteller", India Today, Simply Chennai section, 5th Anniversary Special, Sept 2010. 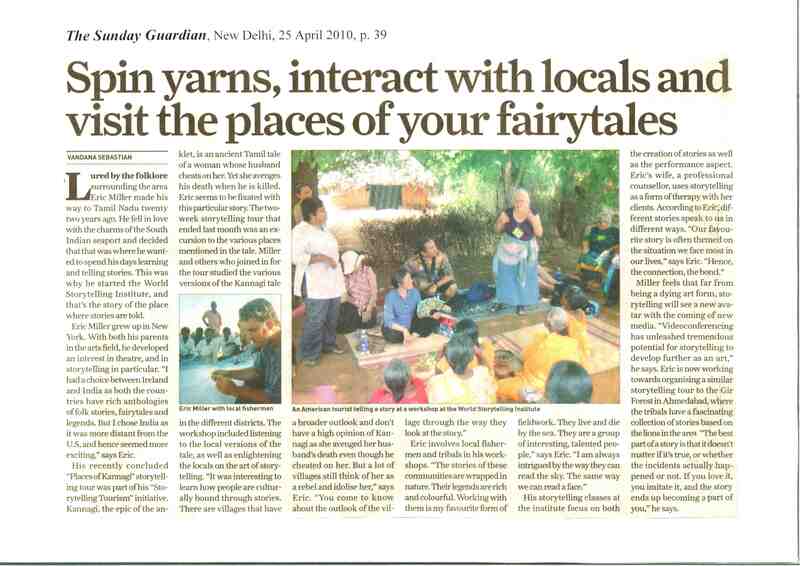 "Spin Yarns, Interact with Locals, and Visit the Places of Your Fairytales", Sunday Guardian, New Delhi edition, 25 April 2010. About about the WSI's "Places of Kannagi" Tour. "Bring Back the Storyteller! ", Times of India, 4 April 2010. "A Whale of a Tale", The Hindu, 4 March 2009. About the WSI's work with members of Chennai's sea-fishing communities . 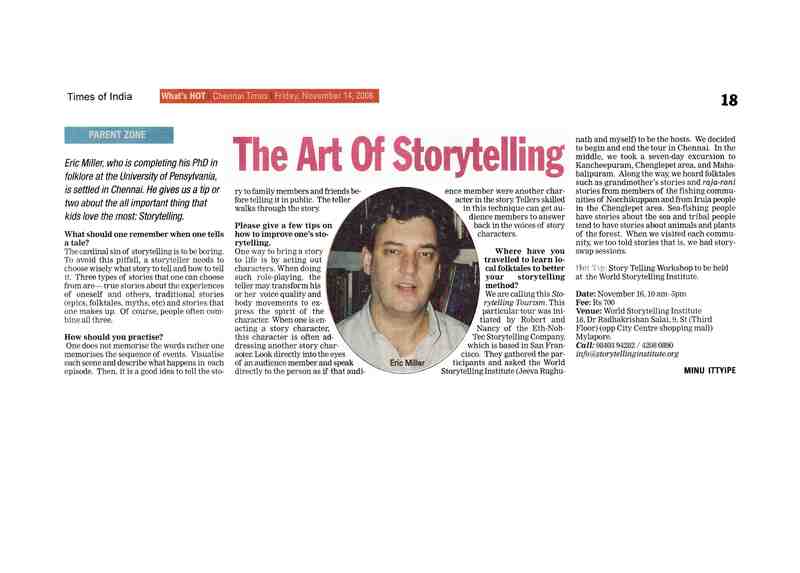 "The Art of Storytelling", Times of India, 14 Nov 2008. 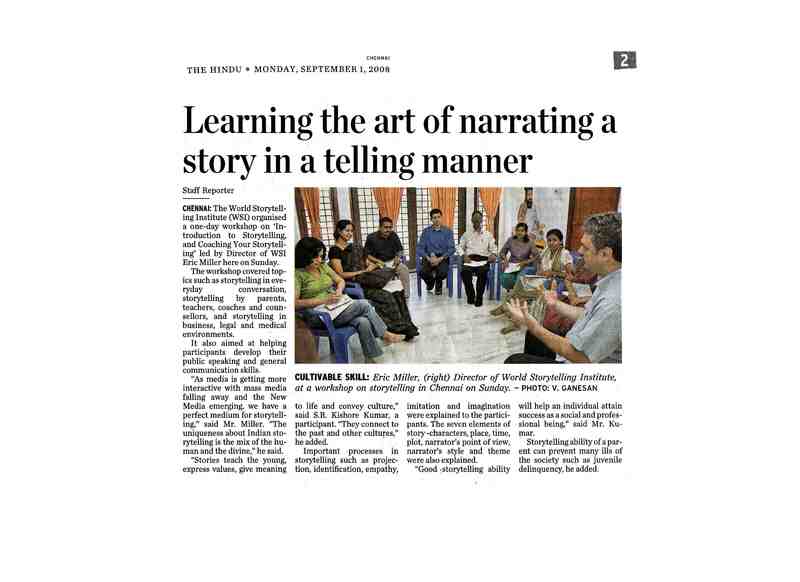 "Learning the Art of Narrating a Story in a Telling Manner," The Hindu, 1 Sept 2008. 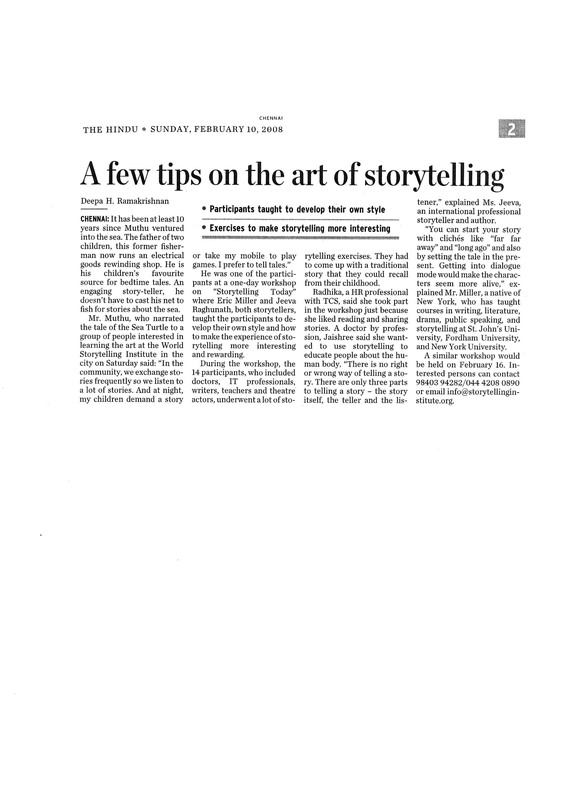 "A Few Tips on the Art of Storytelling", The Hindu, 10 Feb 2008. 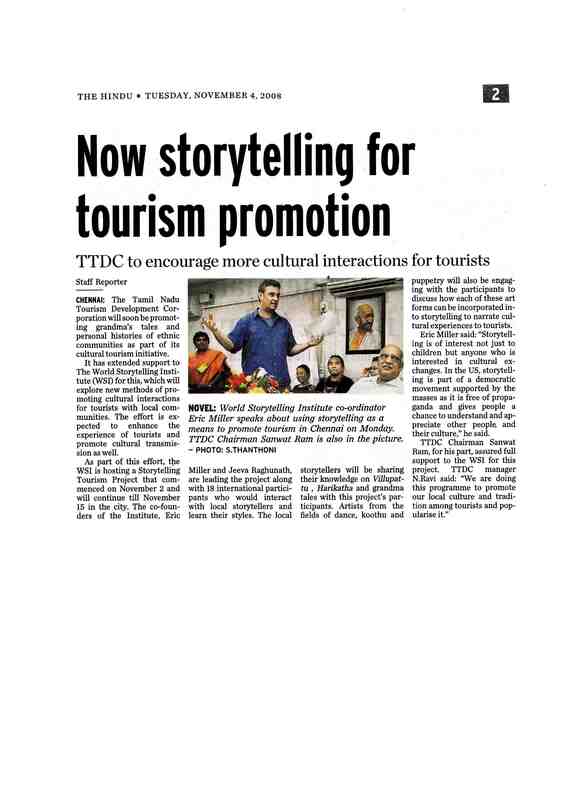 "Now Storytelling for Tourism Promotion", The Hindu, 4 Nov 2008. "Now Tourists Can Go Down Story Trails", Times of India, 1 Nov 2008. 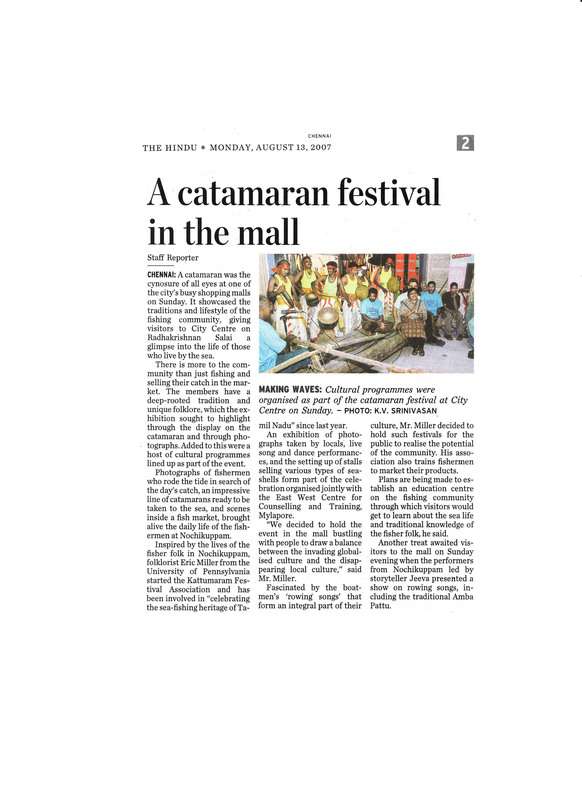 "A Catamaran Festival in the Mall", The Hindu, 13 Aug 2007. 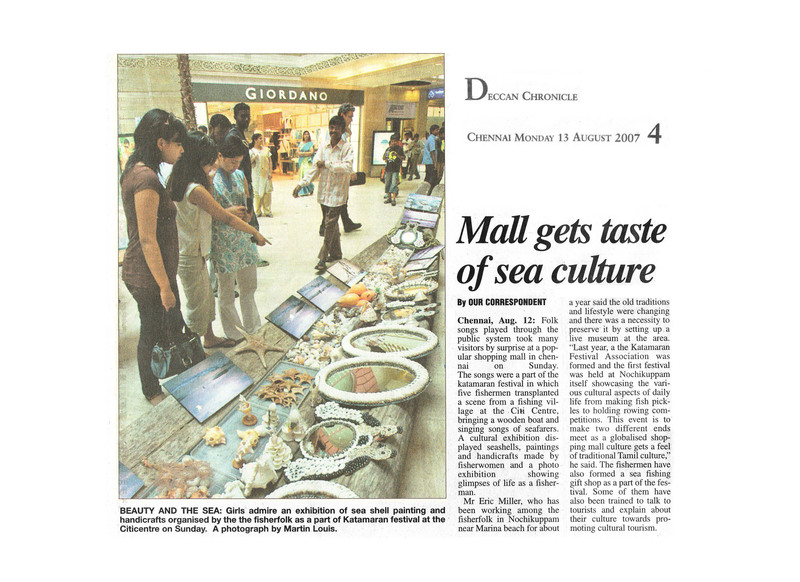 "Mall Gets Taste of Sea Culture", Deccan Chronicle, 13 Aug 2007. 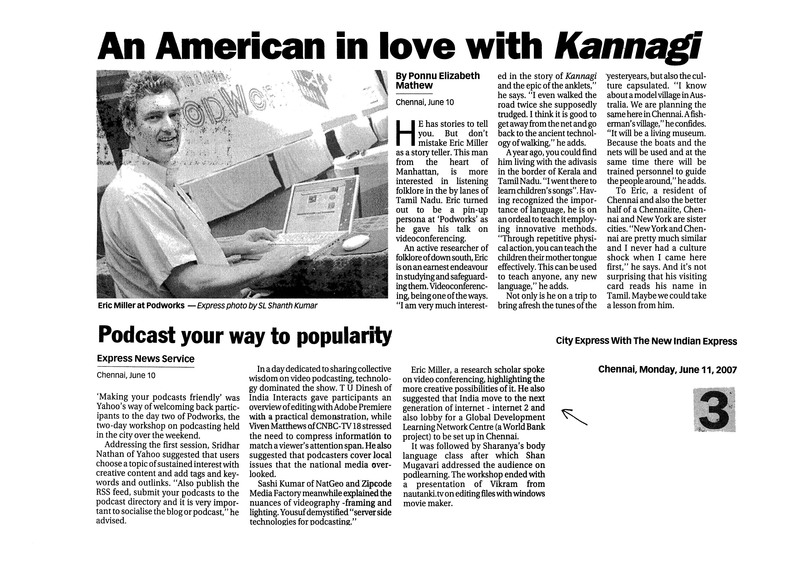 "An American in Love with Kannagi", Indian Express, 11 June 2007. 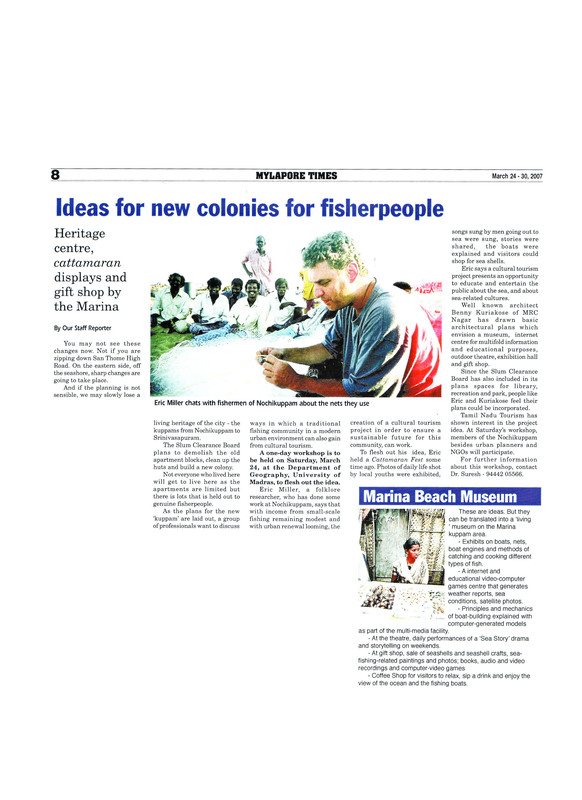 "Ideas for New Colonies for Fishing People: Marina Beach Museum", Mylapore Times, 24 March 2007. 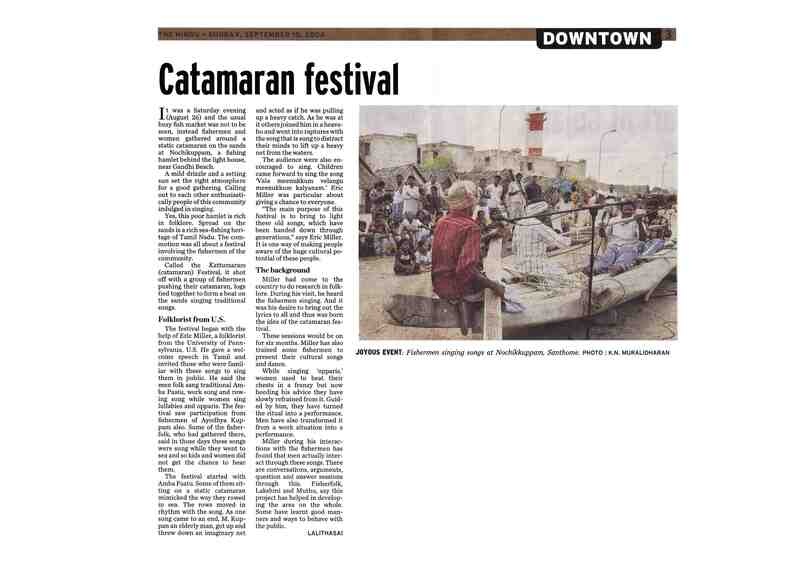 "Catamaran Festival", The Hindu, 10 Sept 2006. 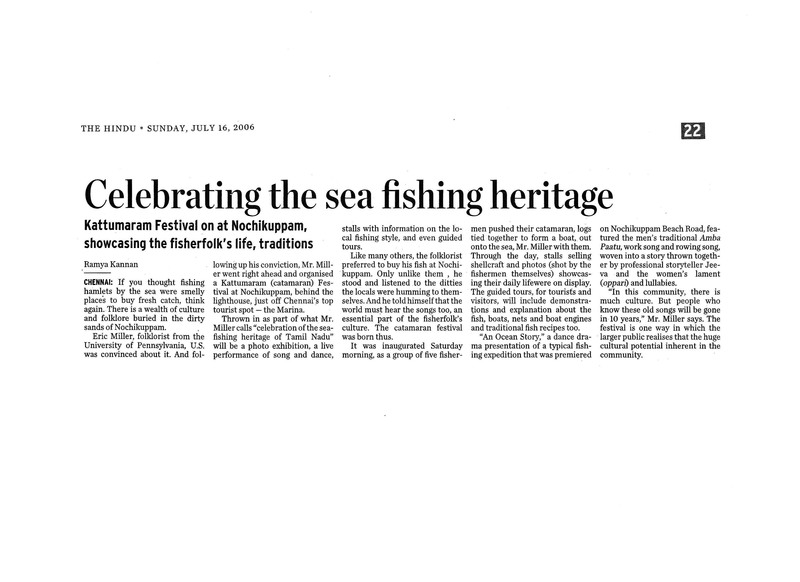 "Celebrating the Sea-fishing Heritage", The Hindu, 16 July 2006. 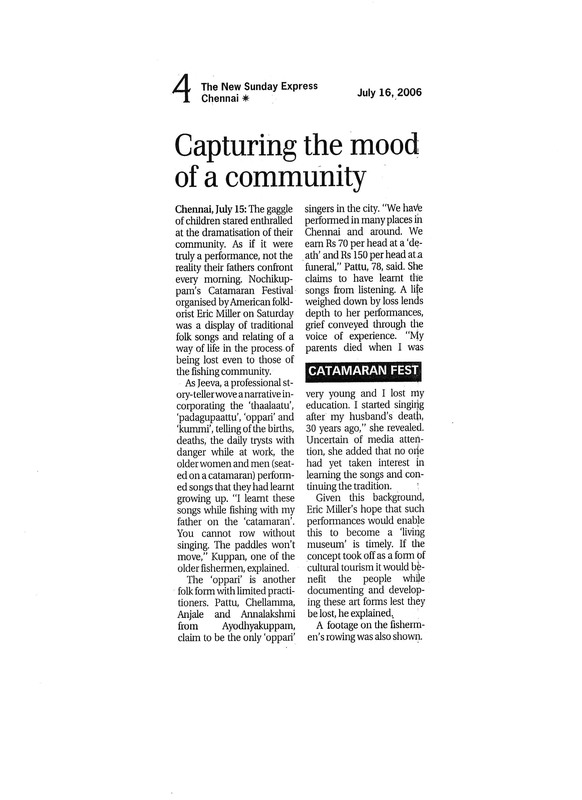 "Capturing the Mood of a Community", Indian Express, 16 July 2006. 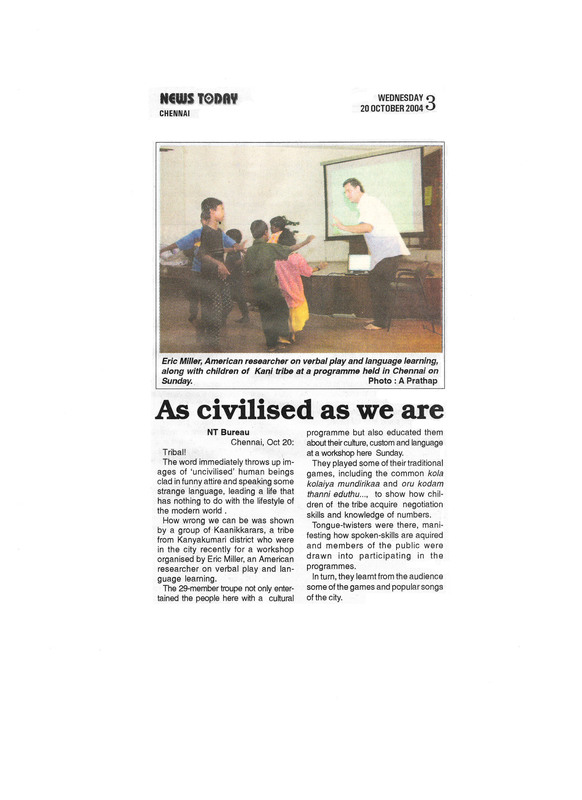 "As Civilised as We Are", News Today, 20 Oct 2004. 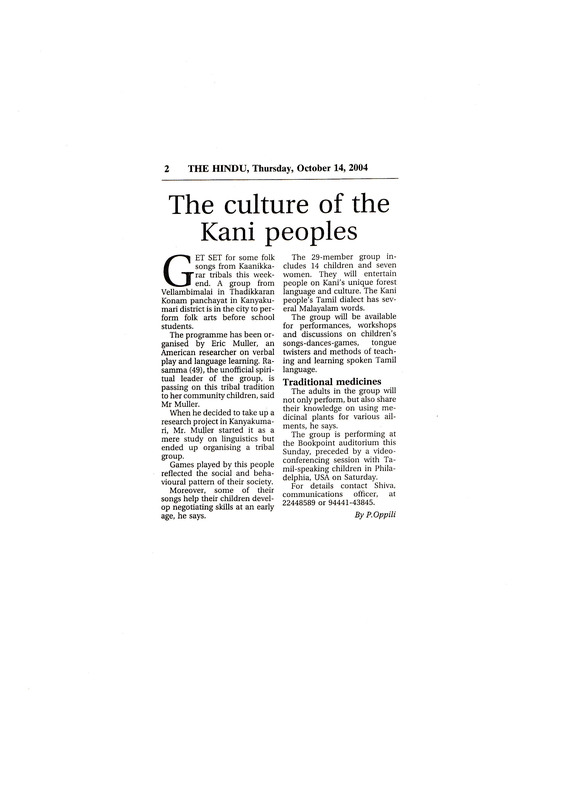 "The Culture of Kaani People", The Hindu, 14 Oct 2004. 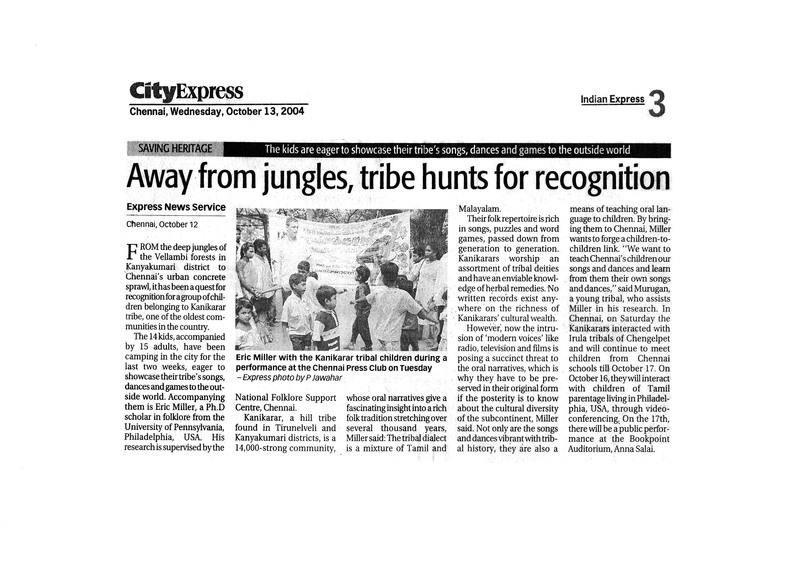 "Away from Jungles, Tribe Hunts for Recognition" Indian Express, 13 Oct 2004. 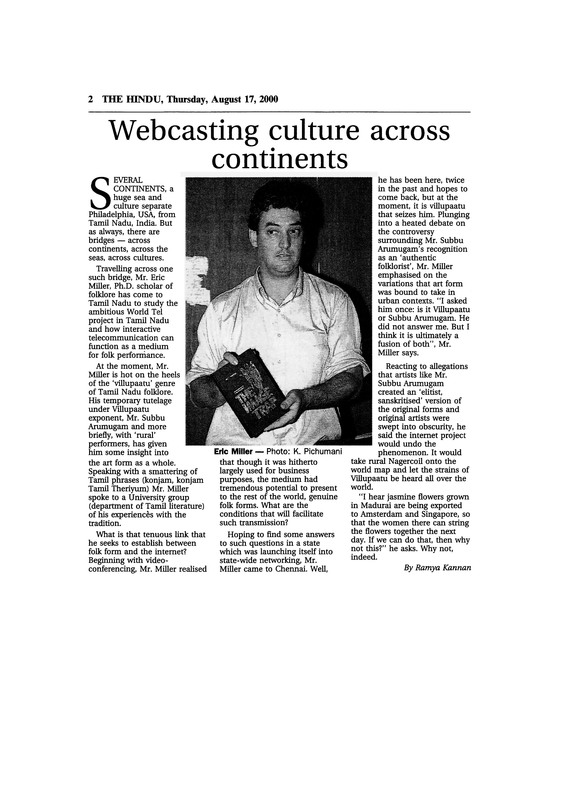 "Webcasting Culture Across Continents", The Hindu, 17 Aug 2000. 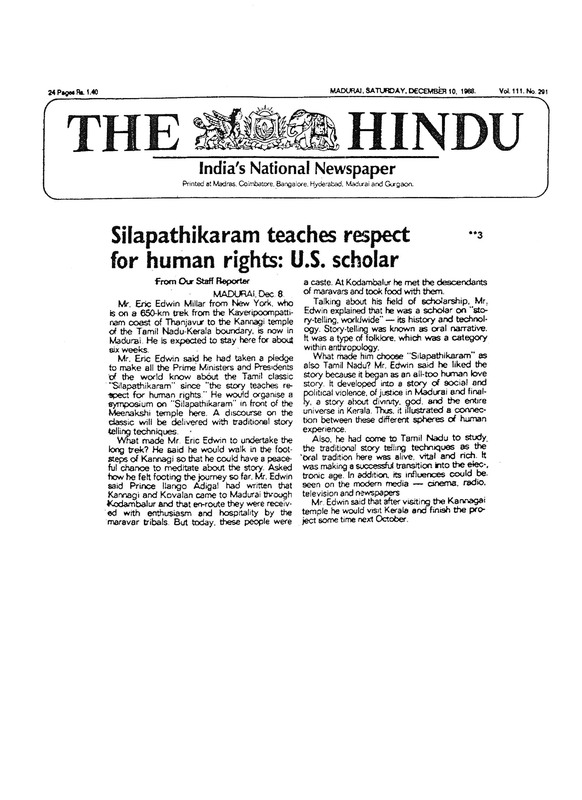 "Silappathikaram Teaches Respect for Human Rights: US Scholar", The Hindu, 10 Dec 1988. 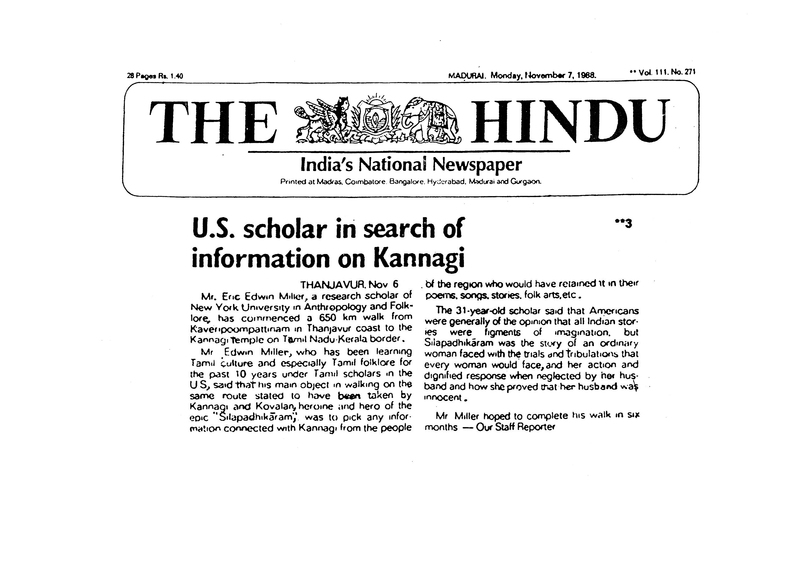 "US Scholar in Search of Information about Kannagi", The Hindu, 7 Nov 1988. "Posture, Gesture, Movement and Dance in Storytelling; and Dance-movement, Storytelling, and Theatre Activities" (2018). Vision Statement: "Storytelling and Interactive Education" (2017). "Ways Storytellers are Using Audio- and Videoconferencing for Training, Discussion, and Performance", 12-page section of Storytelling Magazine, guest-edited by Dr Eric (2017). "Fairytale Therapy: A Type of Storytelling Therapy" (2017). "Story and Storytelling in Storytelling Therapy and Expressive Arts Therapy" (2016). "Expressive Arts Therapy -- including Storytelling Therapy -- in Cultural Context" (2016). "Becoming Oneself: A Goal in Carl Jung's Conception of Therapy" (2016). "Review of a Drama-and-Movement Therapy Workshop" (2016). "Variations in and of the Story of the Silappathikaram (the Epic of the Anklet)" (2016). "The Storytelling Scene in Chennai" (2016). "Ways Verbal Play such as Storytelling and Word-games Can Be Used for Teaching-and-learning Languages" (2015). 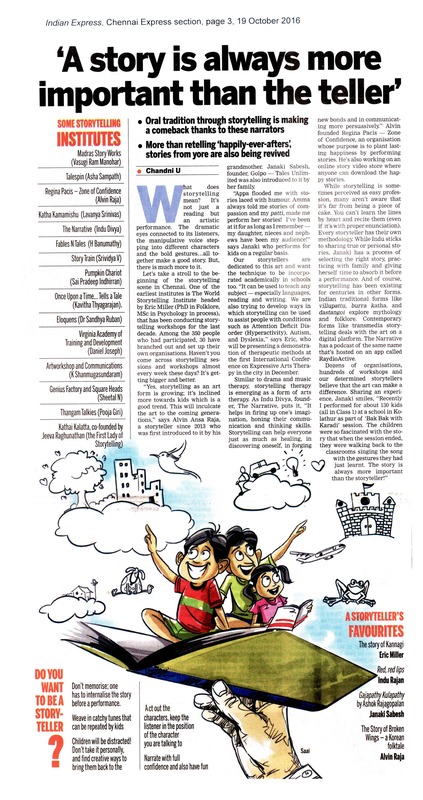 "Child Development, Arts Therapies, Education -- and Storytelling", Teacher Plus Magazine (Hyderabad) (Nov 2014). 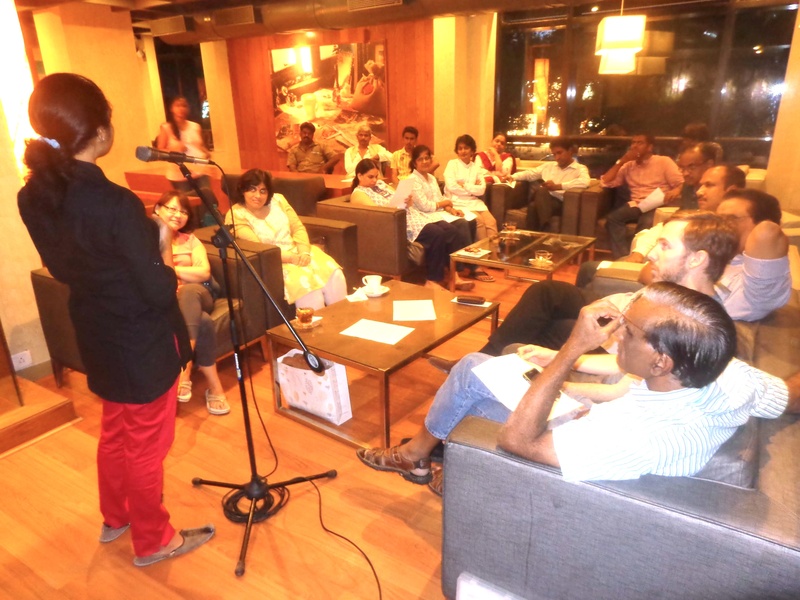 "Storytelling by and for Adults at a Café Coffee Day! ", Cafe Chronicle (2013). "Dance, Movement, Gesture, and Posture in Storytelling" (2013). "Notes after Session 2 of a 3-session Workshop on Role-playing in Storytelling" (2016). 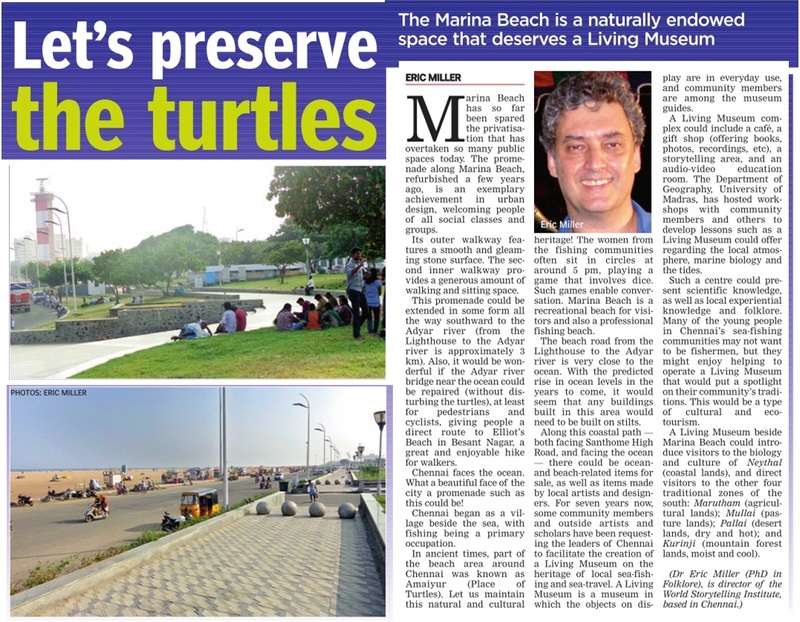 "Marina Beach Deserves a Living Museum", Deccan Chronicle (10 Nov 2013). The original, unedited version of the article is here. "Storytelling in the Age of Videoconferencing", New Moment Magazine for Art and Advertising (Belgrade, Serbia; and Ljubljana, Slovenia) (Nov 2013). The article as plain text is here. "The Value of the Multi-Discipline Approach to Research", Conference Proceedings, Kanyakumari Academy of Arts and Sciences, Annual Meeting (Sept 2013). "Aspects of the Storytelling Revival in India" (August 2011). "Using Storytelling to Encourage Reading" (2011). "Storytelling and Story-listening, and Children's Intellectual, Emotional, and Social Development" (2011). "Theories of Story and Storytelling" (2011). "Ethnographic Videoconferencing, as Applied to Songs/Chants/Dances/Games of South Indian Children, and Language Learning", PhD Dissertation, Folklore Program, University of Pennsylvania (August 2010). 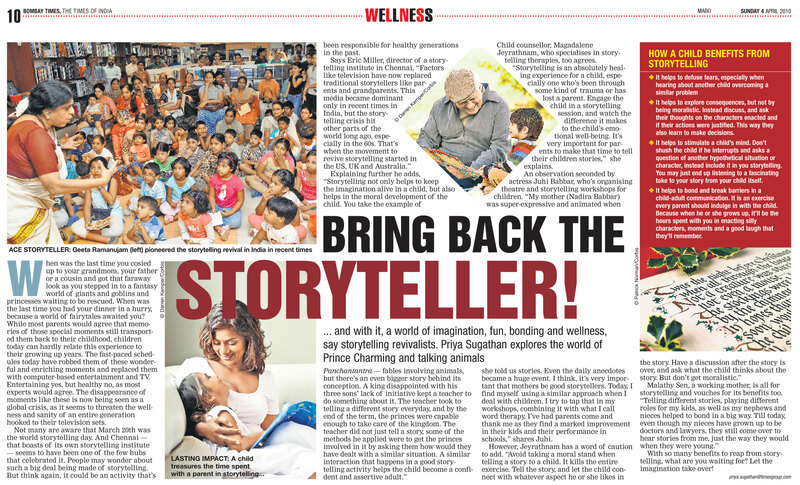 "Weaving Magic: Storytelling in Chennai", Deccan Chronicle (28 March 2010). The original, unedited version of the article is here. "Conducting Folklore Interviews via Videoconference", Education Newsletter, American Folklore Society (Spring 2008). 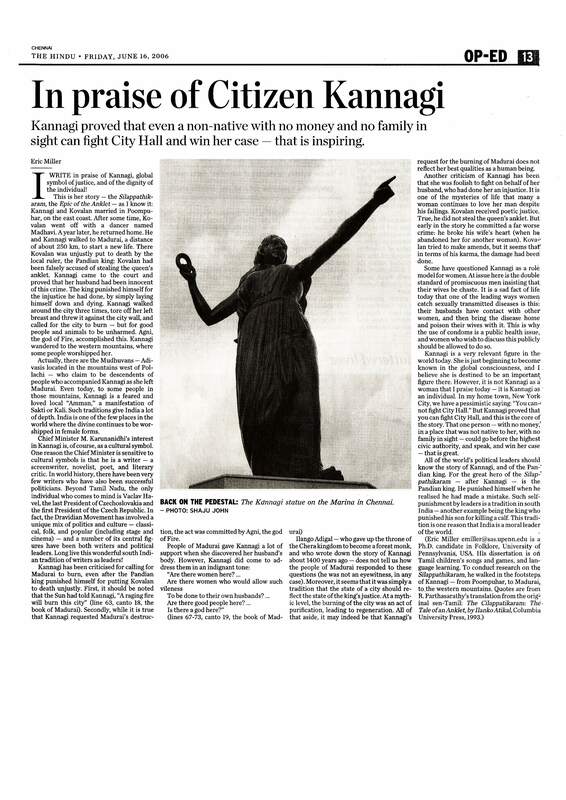 "In Praise of Citizen Kannagi", The Hindu (16 June 2006). About the heroine of a Tamil epic. for Kaani Tribal People of Tamil Nadu's Kanyakumari District", Conference Proceedings, Kanyakumari Academy of Arts and Sciences, Annual Meeting (Oct 2004). Co-authored with Murugan Narayanan Kaani. "Chennai and Videoconferencing: Videoconferencing for Performing, Teaching, and Discussing Tamil Language and Performing Arts", Conference Proceedings, International Forum for Information Technology in Tamil (2003). "Verbal Play and Language Acquisition" (2003). "The Performance of Epic and the Practice of Lament" (2001). "Continuity and Change in Chinese Storytelling" (2000). "Turn-Taking and Relevance in Conversation" (1999). "Roleplaying in an African Storytelling Event" (1998). "Tamil Nadu's Silappathikaram (Epic of the Anklet): Ancient Story and Modern Identity", Self-published booklet (1991). Links to more of Dr Eric's writings are on his personal webpage. The inaugural "Places of Kannagi Storytelling Tour" occurred 22 February, to 7 March, 2010. Watch a 21-minute video documentary about the 2010 Tour. The Places of Kannagi Tour Poster is here. The Tour blog is at http://kannagistorytellingtour.blogspot.com. Additional info about the Tour is here. The two-day visit with the "Kathaiyum Paattum" ("Story and Song") Storytellers of Thanjavur, on 5-6 Feb 2013 (following the Chennai Storytelling Festival), was a partial Tour. Info about this visit is here. New editions of the Tour are being planned -- to parts of the route, and to the entire route. Please contact us if you might be interested in joining, or helping to organise, an edition of the Tour. Presented by the WSI in partnership with residents of Chennai's sea-fishing neighborhoods beside Marina Beach -- including Ayodhya Kuppam, Nadu Kuppam, Nocchi Kuppam, Nocchi Nagar, Dooming Kuppam, Srinivasapuram, and Oorur. Multimedia presentation -- featuring video recordings, 500 photos taken by community members, and paintings about the sea. Guided tour of the fish market area, and of the working area on the beach -- including discussion about the boats, nets, engines, fish, weather, etc. Performances of "The Sea Story," a drama with folk songs. Storytelling (Grandmother Stories, Raja-Rani Stories, Tenali Raman Stories, Animal Stories, etc) by and with community members. With visual and aural methods of simultaneous translation. Set of Recommendations for a Living Museum about the Heritage of Sea-fishing and Sea-travel in the Nocchi Kuppam area. Specialising in Storytelling for/by/with Adults. Specialising in Storytelling and Counselling. Magdalene Jeyarathnam is also founder-director of Chennai's East-West Center for Counselling and Training, which offers numerous training workshops, including Approaches to Counselling Children (featuring exploration of therapeutic uses of Storytelling, Drama, Music, Dance/Movement, Visual Art, and Play in general). Ms Magdalene has integrated these methods into the EWCFCT's counselling services, and counselling-training, for adults.